These no bake chocolate peanut butter raisin oat bars are so easy to prepare. With just 6 ingredients and time in the fridge you’ll soon be tucking into their delicious chocolateyness! 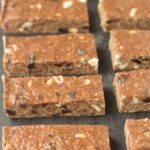 Biting into these tasty no bake chocolate peanut butter raisin oat bars you’ll be surprised at how familiar they may seem. Your first bite will encounter the delicious sweet chocolate taste and then straight after that the crunch of the peanuts. You’ll be forgiven for thinking that you’re actually eating a snickers bar! These bars are all home made and not made from refined sugar. I’ve used dark chocolate rather than milk chocolate as that’s better for you. 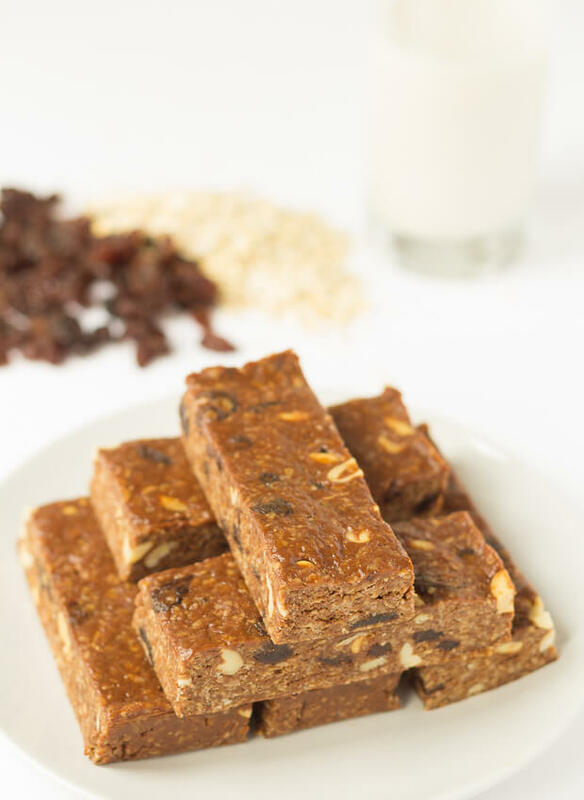 They’re full of good wholesome ingredients – oats, peanut butter, honey, peanuts and raisins. All ingredients which I bet you can find in most kitchen cupboards! These bars require just 6 ingredients and 10 minutes to make. Then stick them in the fridge for a few hours, or better still overnight. There will be no need to buy those unhealthy brand named bars I mentioned above. Very soon you’ll have perfect lunchbox sized snack bars. They make perfect on the go snacks or a healthy dessert option too. Plus they freeze easily so you can keep them in your freezer until you need them. That is of course if they last. I find I NEED THEM every day! Remember my no bake almond oat bars that I made and we took up Ben Nevis? Well it’s been a while (I know) since I brought you another of the snack recipes I love to make to take hill walking, so this is it! And you folks seem to love them too going by the sharing of those no bake bar recipes I’ve made on Pinterest. So I hope I hit the spot with these too, I’d love to hear what you think in the comments below. Talking of hill walking Mike and I are preparing for a weekend away rambling about in the Scottish mountains. We’re off up to the Drumochter region this weekend staying in the same place that I mentioned in the last hill walking write-up, Meall Chuaich, Drumochter Winter Hillwalk. However, we did get out in April where we climbed Ben More and Stob Binnein. That was an amazing day. Check out those photographs and a video too. These no bake chocolate peanut butter raisin oat bars are so easy to prepare. Line the bottom and sides of an 8x8inch square baking tin with greaseproof / parchment paper. In a large saucepan over a gentle heat, place the peanut butter, honey and dark chocolate and stirring constantly, allow these to melt and infuse together. Remove from the heat. Stir in the oats, peanuts and raisins, then combine the mixture well together. Put the combined sticky mixture into the lined baking tin and flatten it out all over by pressing down with the tips of your fingers making sure the bottom of the tin is evenly lined. Place the baking tin into the fridge for at last 4 hours, but preferably overnight. In the morning, remove from the fridge, lift out the hardened slab using the greaseproof paper onto a cutting board, and cut into 8 bars. Store in a fridge in an airtight container to keep as fresh as possible until time to eat. 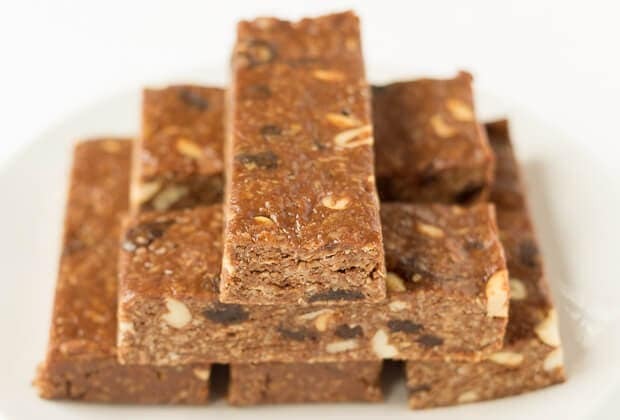 So folks, I’ll be taking a batch of these no bake chocolate peanut butter raisin oat bars up hill walking for Mike and I to consume this weekend, keep your fingers crossed that the weather is kind to us! For next Tuesday’s post, something different. Lady Lynne and I have put together a handy post, “10 ways to make your holiday spending stretch further” which we compiled whilst on our recent trip to Hawaii and San Francisco. We thought we would share all our best tips that we use to make our spending money go further on the amazing trips we have and hope that you might be able to make use of those tips too, to ensure you enjoy those special times as much as possible. So. have a great weekend and I’ll catch you then! I hope your boys enjoy these as much as I enjoyed making them, and then eating them too! There are a few of these left frozen in the freezer……. These take hardly any time to defrost as well Rebecca. That’s if you can wait that long. But seeing as you like them chewy, like me too, I think we can both safely say that they wouldn’t last that long! Oo I bet Alex would loves these! I’m glad that the peanut butter mixed in is a good “raisin” why you could eat the raisins! Ha ha ha ha! 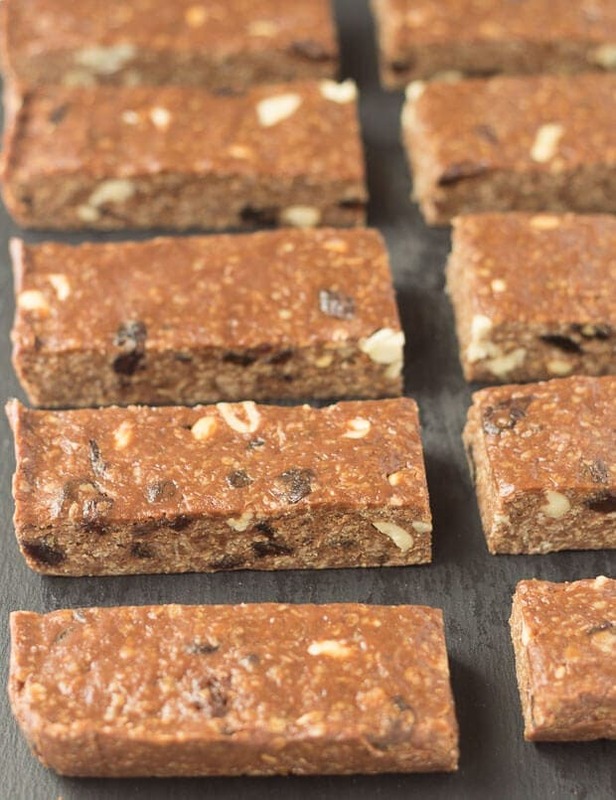 6 simple ingredients came together so beautifully in these bars! 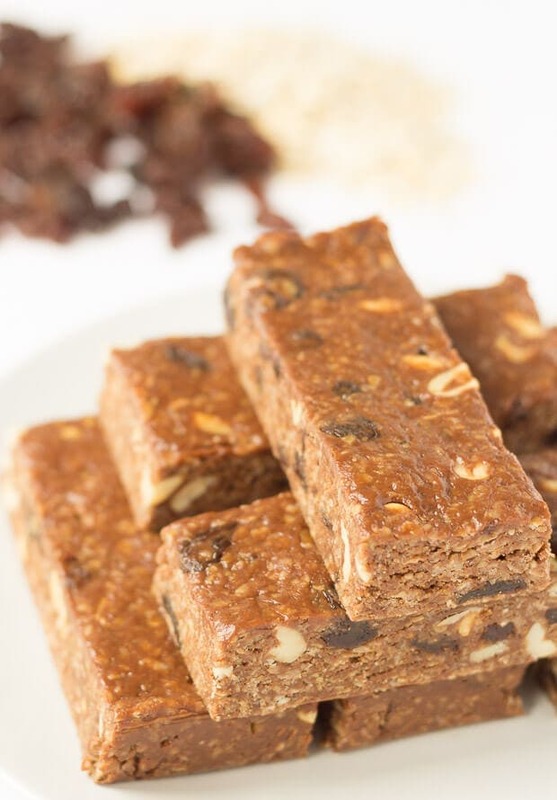 Neil – so love that they are made with honey and raisins – keeps the sugar steadier on long hikes for sure! Looking forward to those pictures AND video of your hill walking adventures! I always love my slow energy release home made bars when I’m hill walking Shashi. Wow, that’s fantastic David. So glad to hear that you were in Fort William. It’s one of my favourite places, and I love climbing Ben Nevis, as you read.